Mohamed’s Enterprise yesterday officially continued its sponsorship of the Boyce/Jefford Track and Field Classic, which will host its Fifth Edition, August 16-17, at the Mackenzie Sports Club (MSC) Ground, Linden. 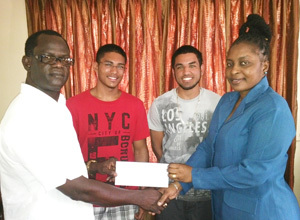 Representative of Mohamed’s Enterprise, Dione Johnson hands over the sponsorship cheque to Colin Boyce yesterday while other representatives, Christopher Morgan (2nd left) and Robin Sookraj share the moment. Mohamed’s Enterprise is one of the foundation sponsors of the event and Managing Director of the company, Nazar Mohamed believes that Linden needs such activities. He said that they will continue to support the meet that helps the community. Chairman of the Boyce & Jefford Classic Management Committee, Boyce, thanked the company for their support, adding that without the continued efforts of sponsors, the meet cannot continue to import athletes aimed at raising the bar locally. Mohamed’s Enterprise has specifically sponsored the individual prizes for the Male and Female Masters’ 60m sprint races, which is designed to attract former athletes to roll back the years and give the audience a blast from the past. The winners of both races will pocket $25,000 each while second and third places are to receive $15,000 and $10,000 each respectively; trophies will accompany the cash prizes for the Masters’ races that are expected attract some credible athletes. Apart from dolling out lucrative cash prizes to clubs and athletes, the Boyce & Jefford Track and Field Classic V is aimed at continuing to establish a prominent place for athletics in Guyana and as was evident last year, leading athletes from the Caribbean are expected to compete against the crème de le crème in Guyana.